In the time that we’ve been home I’ve been slowly going through the things we accumulated at the three hospitals Rebekah spent time in. I find myself coming back to the same few things over and over. Two are pictures of her after she was transported to St. Elizabeth’s Special Care Nursery the night she was born. The others are also pictures. This time the pictures are of her in Akron Children’s Hospital’s NICU the day she failed extubation and had to stay on the ventilator, the day Santa Clause came to the hospital, and the day she and her TLC roomie had on matching sleepers. All of those pictures were possible because of the March of Dimes. Before Bekah was born I thought that the March of Dimes simply funded research. 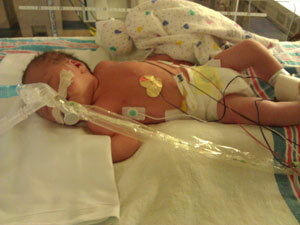 As Bekah’s 10-week NICU stay progressed, I was able to see just how much more than research the March of Dimes does. Not only does the March of Dimes help premature babies by providing funds for research, but it also helps premature babies by helping the families of those babies. As I placed things in a box (Actually, it’s a “Tiny Tub,” a plastic storage box not much bigger than a shoe box. It was Bekah’s bathtub while she was in the NICU) to save for Bekah, I noticed that the meal voucher I had saved from St. Elizabeth’s had been paid for by the March of Dimes. At Akron Children’s there are numerous events sponsored by the March of Dimes. A mommy (or daddy, or grandparent, etc.) can take a few minutes away from the isolette or crib to spend some time watching educational videos while eating pizza and getting to know others in the same situation. One can make an isolette cover to celebrate the fact that the baby is well enough to have his or her isolette covered instead of needing to be in sight at all times. I still remember how excited we were the day we could shield Bekah from the bright lights of Pod 3. Now she uses her cover at home to practice her rolling skills. While everyone knows that most of the babies in the NICU don’t know who Santa is, the March of Dimes brought Santa to every baby. And, while the babies may not have cared, the parents and brothers and sisters of all those babies certainly appreciated it. The things that the March of Dimes helps to do are too many to list, but they are all important, especially in the middle of the emotional turmoil that comes with getting adjusted to life with a NICU baby. The scrapbook that I’ve been working on started as a March of Dimes project. In it are the pictures I’ve come to treasure. When everyone else was clipping hospital pictures of cute babies wrapped in blankies wearing their little hats, we were watching our baby cling to life — but a quick-thinking nurse, and a March of Dimes camera, made it possible for us to treasure those first hours forever. So, did we make a million wallet-sized copies and mail them to everyone? No, but we did make copies and use them as part of Bekah’s Christmas gift to her grandparents. While it’s not a pretty picture, it is a very real one. One we will treasure and are grateful we have. It’s one we wouldn’t have had if it weren’t for the March of Dimes. This year when my family walks in the March of Dimes “March for Babies,” we’ll be walking not just to help prevent the premature births of other babies, but because we can never repay the gift the March of Dimes gave us when Bekah’s first nurse snapped that first picture of our beautiful girl. If you’re not busy May 5, start a team, find a team, or come join us in Akron to walk for Bekah, and all of the babies like her! Ok Sarah, once again you have brought tears to my eyes and goose bumps throughout my body just by reading your blog. You sure do have a way with words! If there is room on your team I would love to walk with you and your family. Let me know the information and hopefully I can get Rachel to join as well. I am not sure when the best time to call as your home is pretty busy so please call me anytime after 5pm @ 330-505-1859. I would love to be a part of this!! !